Cape into the warm sub-tropical waters of the Wild Coast, direction north , finally going in shore on the Kwazulu-Natal coast . The sardines usually disperse into the big blue ocean near Durban.. 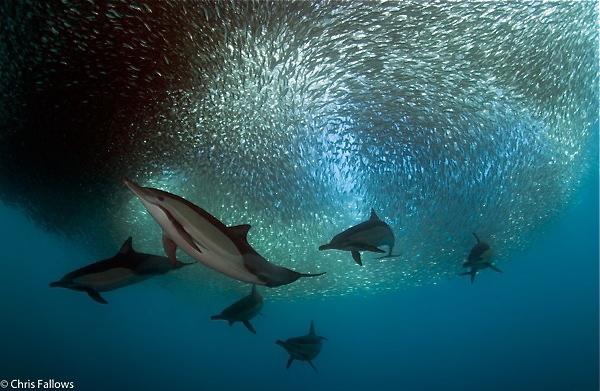 The sardines shoal closely together minimising their chances of being taken by predators. Tens of thousands of birds plunging from the sky, feeding on the fish, with larger game fish and numerous species of sharks all feasting on the wealth of food that is available. The numbers and variety of sharks is astounding: Bronze Whalers, Dusky sharks, Black tips, Zambezi sharks and many more can be seen in massive numbers. Sometimes even Great White Sharks are seen. The dolphins also join in the excitement and employ a hunting strategy that works the shoals into what is referred to as a "baitball". By working together, like sheepdogs in a field of sheep, the dolphins herd the sardines into a tight ball and push them towards the surface. The dolphins then pounce on them, gorging themselves on the tiny fish. 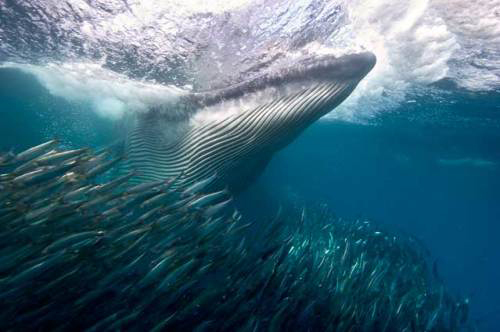 Even whales are often seen feeding on the sardines. All experienced marine observers, photographers and film makers agree on one thing - That the sardine run is the greatest ocean spectacle they have ever seen. They also agree that it is the most difficult marine spectacle to experience. The normal and usual way to do the sardine run, is to go to a specific place on the Wild Coast, for example, Port St Johns or East London, and simply wait there for the sardines to arrive. It means the "normal" tour starts by flying in to either East London or Durban, and from one of these airports drive to the chosen location on the Wild Coast, and wait for the sardine action. Normally the dive base is fixed at some hotel or resort, where the divers stay for the duration of the tour. veteran film maker from Cape Town - South Africa. Now, as I sit in front of my computer, attempting to put the experiences of the past week into writing, I know that I will fail dismally in capturing the crazy excitement of being part of one of nature’s most mpressive climatic events. moving action and some huge seas, I admitted defeat and returned to my home in Cape Town. A few days later I received an excited call from a friend to say that he after waiting all this time around the south Wild Coast London, he finally went further down the coast to see what was happening there. In the central Wild coast area, to the north of East London, and had heard about a good sized group of sardines along with feeding Brydes whales. Eventually, as we neared our destination, we began to see common dolphins and Cape gannets swooping over the sea. These are the vital baitball indicators. The dolphins, operating in co-operative groups, work the sardines up from the deeper, cooler water, using a combination of their charging action and blowing bubbles. The gannets, their pure white plumage easily spotted from afar, are a vital tool for guiding us to the action. The gannets, along with a variety of other predators, take advantage of the common dolphin’s herding skills. Suddenly we were on the action. Gannets flew over the baitball and the air was alive with their excited squawking. Others reigned down from above, hitting the water at an incredible 160 Km / hour with a loud thud. Once their impact velocity decreases, the gannets have the ability to use their wings and feet to continue chasing sardines to a depth of over 20 metres. Common dolphins were charging in from all sides. We could see sharks cruising near the water surface. One can only describe the scene as organised chaos. This is what I had waited for: it was time to get into the water. We have discussed before how difficult it is to catch good sardine action. 1. Rough weather is a very important factor to consider. June/July is the heart of the South African winter, with massive winter storms coming through from time to time. 2. The movement of the sardines are a second factor. The movement of the big shoal of fish is influenced by water temperature, so the wind and the currents are important... and this cannot be predicted accurrately. Sometimes the sardines start shoaling early in the season, sometimes later. Sometimes smaller shoals form and sometimes bigger ones, and nobody can accurrately predict the movement of the shoals. 3. So the normal strategy is simply to wait at one location and hope for the best. Getting all the logistics in place, getting the boats, airplanes, vehicles and diving compressors and other logistical things in place is a major undertaking. 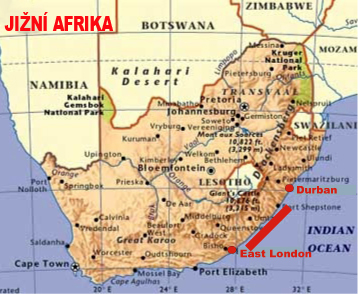 The central Wild Coast is 500 km from Durban, and 300 km from East London. The weather we cannot control, and the movement of the sardines we cannot control. The only factor that we can control is our own movement, so instead of waiting in frustration for the sardines to arrive at a specific place, we are increasing our chances to move to where the sardines are.. or at least where we have the biggest chance of finding sardines. SARDINERUN - SARD expeditions US$ 4000 – 8 nightsDiving package includes:• Return transfers from Durban to Wild Coast Lodge ( 400 km)• 8 nights at Wild Coast Lodge on a full board basis• Full day excursions on boat (07h00 to 14h00) – weather permitting• 7 days at sea (weather permitting, in reality only 4 or maybe 5 days)• Snacks and refreshments while on the boat• A dedicated microlight pilot to inform the group of the sardine action with a VHF radio• Air fills, cylinder and weight belt (if diving)Diving package excludes:• All international and regional flights• Drinks and meals not specified• Medical insurance• Dive gear hire (BC, regulator, mask, fins, wetsuit, etc)• Other activities such as microlight flip, horse riding, nature walks or scenic drivesSARD Programme :Day 1On arrival at Durban International Airport, you will be greeted by a Sard xpeditions representative, who will brief you on what to expect from your trip. 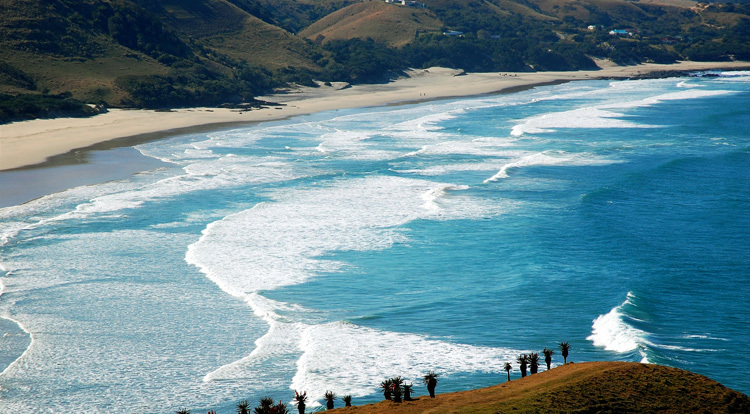 Transfer to the Wild Coast Lodge by road, which is pproximately a four-hour drive from the airport. At check-in you will be given a brief orientation of the following days’ vents, and informed on other activities on offer in and around the area.Day 2 - 8Enjoy an action-packed few days enjoying phenomenal marine-life and other activities in the area. The boat launches from the beach between 06h30 to 07h30 depending on the sardine action, the daylight and your choice of an earlier breakfast at the lodge, or breakfast on board the boat. A microlight is on hand to report to the boat of the any action in the ocean a 20 km radius of the shore. Once the boat has found the ardines, (usually by the large flocks of sea birds or the schools of dolphins in the vicinity of the fish) you can choose to either witness the spectacle by snorkel or Scuba, or from the deck. The choice is yours to enjoy a packed lunch on board the boat or return to the lodge in the early afternoon for a late lunch. Enjoy the remainder of the day at your leisure. Choose from the following activities on offer : a microlight flip, horse riding, walks or scenic drives. A good dinner is enjoyed at the lodge each evening, followed by a relaxed discussion with your skipper and microlight pilot on the next day’s arrangements.Day 9Breakfast will be served at the lodge before check out and transfer to the airport for your departure flight.The important thing to know with this normal Sardine run tour is that you are waiting for about one week at one predetermined place for the action to happen.